Scotty Moore, Elvis Presley's longtime guitarist and rock guitar pioneer, died Tuesday at his home in Nashville, Tennessee. He was 84. Known as the "guitar that changed the world," Scotty Moore was there when so much of early rock 'n' roll history happened—from helping a young Elvis Presley cut his debut track "That's All Right" to seeing that same young singer become the King of Rock 'n' Roll, playing on such timeless hits as "Hound Dog," "Heartbreak Hotel," "Jailhouse Rock," and "Mystery Train." Born in Gadsden, Tennessee, Moore began playing guitar at age 8. He was a fan of country music and jazz and soon became enamored with the playing of Chet Atkins and Les Paul, emulating both legends in the way he drew from various musical styles to shape his own guitar style. "Scotty Moore brilliantly blended country and blues guitar into groundbreaking proto-rockabilly," says Dave Rubin, noted blues and early rock guitar historian. "And beyond being the guitarist who turned the blues of 'That's All Right (Mama)' into the genre-busting music of post-World War II America, he was also a fine jazz player." After serving in the U.S. Navy, Moore moved to Memphis, where, in 1954, legendary Sun Records founder Sam Phillips paired him and bassist Bill Black up with a promising young singer named Elvis Presley and asked them to feel out the hip-shaking hard strummer. As Moore as recounted several times over the years, the session was not going all that great until Presley broke into a cover of bluesman Arthur "Big Boy" Crudup's 1946 recording "That's All Right (Mama)." It caught the ear of Phillips, who told them to keep running through the tune, and that, as Moore says, was "the beginning of, how do you say it—all hell breaking loose!" Guitarist Tom Kolb is not only one of our longest-tenured instructors here at GuitarInstructor.com but also one of our most popular. A professional guitarist for several decades, Kolb has taught at Musicians Institute for over 25 years, played with the Edgar Winter Group, the Monkees, the Turtles, and Mitch Ryder, served as music director for Mark Lindsey (Paul Revere and the Raiders), and even jammed with Steven Spielberg on some Klezmer music. In this interview, Kolb offers tips and advice for guitarists looking to improve their playing. You’ve been an instructor at Musicians Institute for over 25 years now. How did that gig come about? I graduated from the guitar program (then called G.I.T.) in 1989. I was named “student of the year” and received a Howard Roberts fusion guitar for that. Right away, I started getting calls to sub for teachers, and by 1991, I was hired on as full-time staff. As a longtime guitar instructor, what are some of the most common mistakes you see students make? Most commonly, it’s a lack of focus. They sit down and start noodling their favorite licks, and before they know it, an hour has gone by and all they’ve done is played stuff they already know well for the whole practice session. It’s an easy trap to fall into—I do it, you probably do it—because it’s frustrating to learn new skills or new material. Guilty as charged. Are there others? I’ve noticed that students don’t learn repertoire any more; they don’t learn complete songs. Players of our generation learned guitar by learning songs and copying our favorite players. We didn’t learn just the riff. Also, I see many students who spend way too much time learning flashy licks and not nearly enough time on rhythm guitar, chord vocabulary, fills, and the like. I tell my students that if they’re going to play guitar for a living in any capacity, they’re going to be playing rhythm guitar for nearly all of it. One of the main reasons I keep teaching is that it’s like taking lessons. When trying to explain a concept to students, sometimes you have to try to explain the same thing 12 different ways to get everyone to understand it, so you’re forced to come up new ways of looking at concepts that may be old and familiar to you. I’ve also learned that stage fright is far more common than I’d ever thought. Everyone gets nervous to some degree when performing publicly—including me. From helping my students learn to deal with it, I’ve learned how to handle my own nerves, how to not be afraid to express myself musically, and how to not worry what anyone else thinks. I’m a very busy teacher, but I’m first and foremost a player. I play in a very successful cover band that tours and plays lots of Hollywood parties and other private events, where our set list is dictated by what the client wants, so I sometimes learn 20 new songs a month. And it’s through learning new songs—some that I’ve never even heard of—that I learn new things on the guitar. For example, with some of the newer, contemporary tunes, I encounter strange tunings and chord shapes that I need to figure out and learn how to play. And because I work with two keyboard players, we learn a lot of our songs in unfriendly guitar keys, like Gb or Db, so I can’t always rely on basic open chords and familiar patterns. I’ve actually learned how to play The Beatles’ “here Comes the Sun” using my index finger in place of a capo! What 5 tips would you offer to improve your playing? As I alluded to earlier, I think it’s imperative that guitarists build repertoire. If nothing else, learn every Beatles solo—you’ll learn how music works just in doing that! When you learn a solo, take the time to learn why it works over the chords. Learn how to transpose music, so you can use your favorite licks in other keys. Listen—especially to other musicians. Playing with loops and backing tracks is great practice, but playing with other musicians and listening to what they’re doing is where you get so many new ideas. Finally, over-practice; that is, don’t practice only until you get it right, but when you get it right every single time, and then practice some more. How do you feel about about sight reading? It’s so valuable, yet it’s still a problem for guitar players. Many of my students have to start right from the beginning with learning the staff, the notes, basic theory, and so on. But if you stick with it and become a proficient reader, you’ll end up playing with better players, and that opens up all sorts of opportunities. Even learning how to read chord charts will help. Oftentimes at important auditions, they may just put a chart in front of you, and you need to be able to navigate it and make the music happen. Besides your lessons at here, what instructional products do you recommend to your students? Well, since we were just talking about sight reading, I think David Oakes’ sight reading book, Music Reading for Guitar, is excellent. We also discussed building repertoire, and the new G-Plus Song lessons at GuitarInstructor are great for that. As for my own books, I’m really proud of my Soloing Strategies book and the new Connecting Pentatonic Patterns book, which I use a lot with rock players who are trying to learn the neck. Any final words for guitarists? Tone! Tone! Tone! I know guitarists love to talk about tone, and they chase it constantly, but you’ve got to learn how to dial in a great guitar tone. People won’t listen to you if you’ve got horrible tone. In his newest series of lessons, culled from his latest book Standard Tuning Slide Guitar, Greg Koch shows you how to play blues slide guitar in standard tuning. You'll learn such essential techniques as finger muting, vibrato, playing double and triple stops with a slide, how to create exotic and quirky sounds, fretting behind the slide, and more. 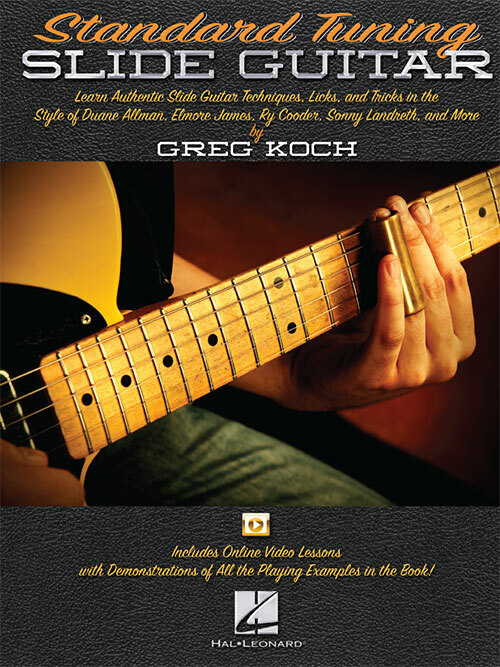 Each video is accompanied by a Lesson Tab PDF file containing the instructional text and guitar tab from the book. Get the Standard Tuning Slide Guitar book/video from MusicDispatch.com. This week's "Free Lesson Friday" features a cool liquid blues-rock legato lick courtesy of Troy Stetina. For more bluesy rock licks, check out Troy's Blues-Infused Rock Licks lesson. For this week's installment of "Free Lesson Friday," country Telecaster legend Redd Volkaert teaches one of his favorite outro licks, stolen from the great Jerry Reed. Check out Redd's Stolen Licks lesson for this and several other crafty country phrases. The Eagles' "Hotel California" is not only widely considered one of the greatest rock songs of all time but also a guitar-playing tour de force. Featuring the fine fretwork of guitarists Don Felder and Joe Walsh, the tune is chock full of legendary riffs and solos, from the opening 12-string salvos and memorable fills to the timeless guitar solo and harmonized arpeggios that compose the outro. In our newest G-Plus Song lesson, instructor Doug Boduch takes you through each section of the accompanying guitar tab, AND he teaches you the harmony parts not shown in the tab. In all, it's just under one hour of video instruction, making this the most comprehensive lesson on "Hotel California" you'll find anywhere. We've also got a new lesson on "Life in the Fast Lane," which features one of our favorite Joe Walsh riffs (and solo) of all time. In this lesson, instructor Greg Koch shows you a deliciously twisted way to approach the IV chord in a standard blues using the whole tone scale. For more of these fretboard shenanigans, check out the full Whole Tone-ing lesson.